"Multiple winner of RoboCup robot football world championship, France will defend its title ! Which humanoid football robot team will win the World Cup this year ?" Robot and Football, the favorite boys’ room décor with some giant E-Glue wall decals ! Science-fiction ? Not really. RoboCup is an international annual robot football competition. By 2050, robot experts even hope to create a team of robots that can best the official human World Soccer Champions… Meanwhile, E-Glue already allows your kids to admire their champions in large wall decals ! 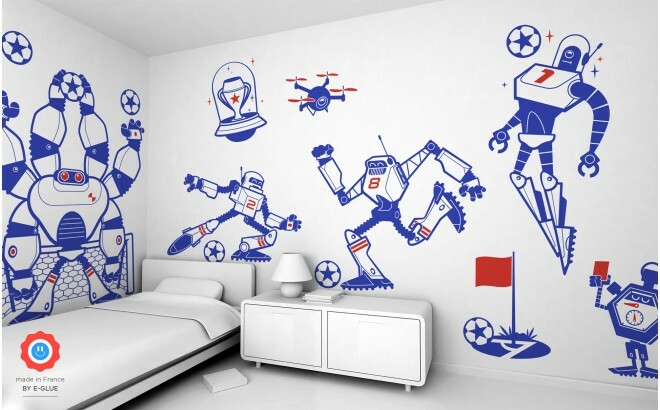 For example, see below a wall decal Striker Robot (brilliant blue and light red) applied on a light grey wall.